Seems like the Rams have developed a SOP (Standard Operating Procedure). Our SOP is to play well in the first half, gain what seems to be a comfortable lead, come back from the halftime break and let the other team run all over us, wake up late in the 4th quarter, and then play valiantly for a short period of time at the very end of the game. Now we stray from this formula a little, but the trend is becoming clear. Usually the outcome of this kind of play is negative and we lose. Today we followed our SOP to the letter and somehow came away with a win. Just like last week against the 49ers we went up early against the Seahawks. Two Austin Davis TD passes and an eighty yard punt return by Stedman Bailey and the Rams had an 18 point lead (3-21) with 7 minutes remaining in the 2nd quarter. Unlike last week’s game we did not cough up a last second half ending TD. Well, we did, but were saved by a Seahawks holding penalty which wiped it out. Instead, the Seahawks were held to a field goal and the Rams went into the half with a much more comfortable lead of 6-21. 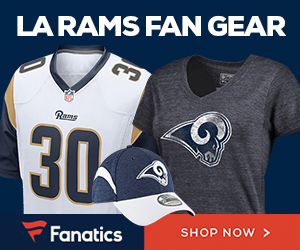 Just like weeks past the Rams came out in the second half and displayed a typical meltdown. The Seahawks owned the play clock as they marched 82 yards and then 92 yards for back to back touchdowns. After missing a 2 point conversion the Seahawks had closed to within 2 points of the Rams (19-21) with nearly 10 minutes left in the game. Straying a little from the formula the Rams then pulled off an impressive 80 yard drive that ended in another short Austin Davis TD pass. This score had little effect on the Seahawks as they immediately returned the favor with their own 80 yard drive also culminating in a TD. 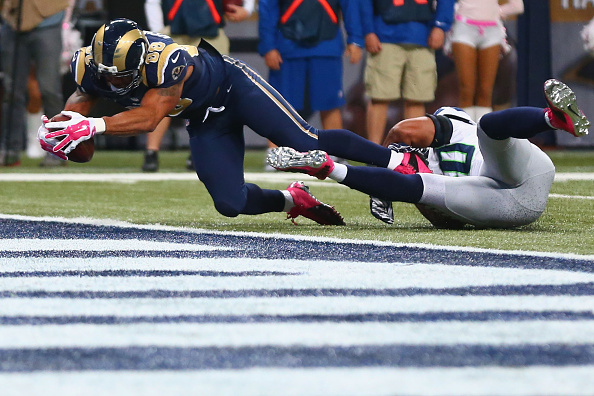 The score is Seattle 26 – Rams 28. At 3:18 left in the game our SOP is to be a score down, have possession of the ball, and have barely time for 1 final drive. This time we lead by 2 points and have one final drive to run out the clock. We have to get a first down or we will lose this game. The Rams run 3 plays, but barely burn 20 seconds off the clock. It’s fourth down and my jaw has hit the floor. All we needed was a single first down and game over, but nooooo. We’re in punt formation and the ball is snapped. Hekker breaks out and passes the ball to Cunningham. IT’S A FAKE PUNT!!! The pass is good and Cunningham has the first down. GO RAMS!!! This game is all but over when Tre Mason runs the ball off the left tackle. He busts through the line and fumbles the ball!!! Everyone scatters and the Rams have the ball. No wait… the ball is loose and the Seahawks have the ball in the middle of the field with a minute remaining. NOOOO. Disaster has shown his ugly face again, but wait… the officials step in and say the ball is dead at the spot of the initial recovery. From the replay it looked like the ball was still live, but the officials called it as they saw it. The Seahawks are out of timeouts and cannot challenge. The Rams kneel down and the game is over. The Rams win the game 26-28 and the crowd goes wild. Although I’m extremely frustrated by the Rams sporadic style of play, hats off to Jeff Fisher for such a gutsy call. The fake punt (along with some lucky officiating) made the difference in the game. The Rams season record improves to 2-4 as we beat this very tough division opponent. The scoring summary is below. Go Rams!!! Actually, the play was ruled as a fumble – check the NFL drive chart at http://www.nfl.com/gamecenter/2014101907/2014/REG7/seahawks@rams#menu=drivechart&tab=recap. Since it was recovered by the rams but not the ball carrier inside the 2 minute warning, the ball went back to the point of the fumble (the “holy roller” rule). Since it was a fumble, the officials should have reviewed the play. They didn’t. Or if they did, they couldn’t see enough evidence to overturn it (I sure didn’t on the replays). So we have two wins where the rams basically got lucky on the last real play of the game – or they would have lost.